UPP is deepening its public outreach and education efforts this year, supplementing its tried and true one-day public workshops with an educational film screening & panel discussion and a series of traveling exhibits. During the months leading up to the Procession, we hold informal one-time workshops in public spaces throughout Providence, in which passers-by can participate at their own speed. 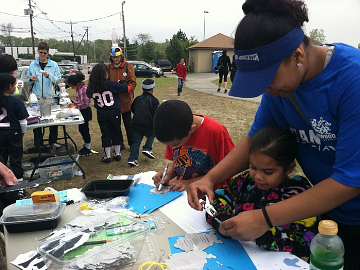 These one-time workshops provide a myriad of materials to create eye-catchingSave the Dates in the shape of Gorham vessels that were once designed and fabricated in the thirty-seven acre Gorham plant on Mashapaug Pond's eastern shores. We also brief participants on the issues facing our urban ponds and how they can help mitigate the effects of stormwater runoff. This is a great way for community members to become quickly educated about the very real concerns we should all have about the health of our ponds. Our hope is that participants will come out and join the crowds June 1st; but even if they don't, at least they will be aware of the pollution in our waters and have been encouraged to do their part to minimize it. So when you see the UPP banner out in public with a table overflowing with ribbons, markers of all colors and crowds of creative minds, please pop in to find out more! In addition to making Save the Date magnets, we facilitated the public's creation of vessel hats. These hats were made out of various commonly available materials, such as wire screening, paper mache, paper and plastic containers embellished with pipe cleaners, aluminum foil, silver papers and string. Balancing them on our heads was a challenge, but most participants walked easily from the start of the procession at Mashapaug Pond Boating Center to Roosevelt Lake in Roger Williams Park, where we all gathered around a specially-made sluice to ceremonially bow and release the water we had carried in our hats, down the sluice to join the Roosevelt waters, just as the water from Mashapaug naturally moves down the Pawtuxet River watershed. 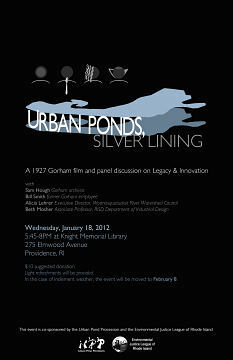 In January, UPP and the Environmental Justice League of RI hosted a public screening of a 1927 silent promotional film produced by Gorham, followed by a panel discussion—with Sam Hough (Gorham archivist), Bill Smith (former Gorham employee), Alicia Lehrer (Executive Director, Woonasquatucket River Watershed Council) and Beth Mosher (Associate Professor, RISD Dept. of Industrial Design)—about artistic and environmental legacy and innovation. The event included a discussion about how present day innovation can help address the toxic legacy left at Mashapaug Pond. In the spring, summer, and fall of 2012, this traveling exhibit, curated by Brown University public humanities graduate student Nate Weisenberg and UPP artist and designer Nora Rabins, brought stories of Mashapaug Pond, the Gorham Silver Manufacturing Company, and life in the Reservoir Triangle neighborhood to children and adults in Providence and surrounding Rhode Island communities. Through one-day public events at J.T. 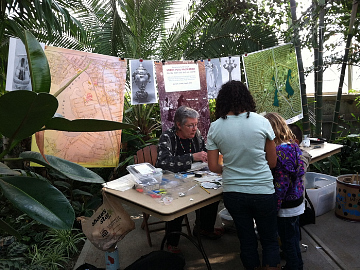 Owens Park, Alvarez High School, and Knight Memorial Library, this exhibit inspired visitors and passers-by to reflect on their own past and present experiences with Mashapaug Pond or another body of water of personal significance. Participants traced and interpreted historical materials, including oral histories, images, maps, and text, inspired by the Reservoir of Memories community exhibit produced in the fall of 2011 by the Brown University Oral History and Community Memory class co -taught by Holly Ewald and Anne Valk. Like the history of the Pond itself, tracing involves reinterpretation and the addition of new layers of meaning, the production of new fragments of history. This project culminated with the public display of tracings at Knight Memorial Library. It also presented oral histories conducted by another Brown University student, Lucy Boltz, in collaboration with former residents of the neighborhood that once stood on the west side of Mashapaug Pond but was demolished by an urban renewal project in 1962 and replaced by the Huntington Industrial Park. 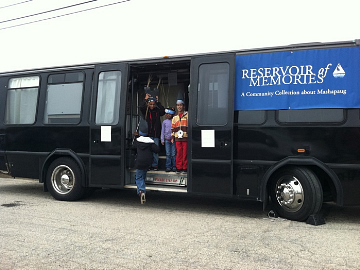 We hope this project will leave visitors of all ages committed to forging stronger, environmentally sustainable communities throughout Rhode Island based on shared connections to valued places in their own lives and neighborhoods. We invite you to continue to explore the history of Mashapaug, consider its relevance to your own experiences, and help us build a new collection of memories via the Reservoir of Memories website. Please stay tuned for more information and reflections about this project.